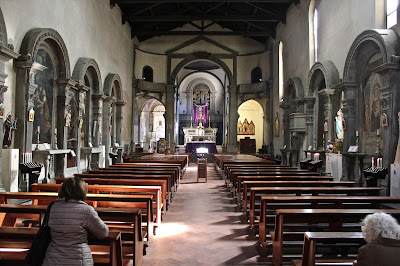 The Roman Anglican: Florentine glory: the Chapel of the Blessed Sacrament in Sant'Ambrogio. 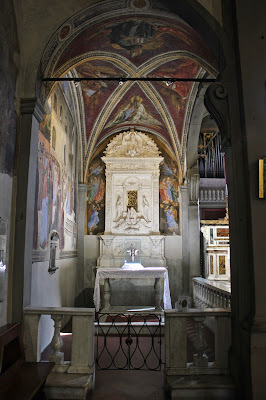 Florentine glory: the Chapel of the Blessed Sacrament in Sant'Ambrogio. The greatest miracle happens every day at the altar, it is important to remember that it is the Eucharist, the sacrifice of Christ who is present in his flesh and blood at all times in this great gift that Christ has bestowed on us, a unique act of love. If the world would truly realise how great a miracle it is, there would be cameras all over the churches, security outside their gates, people would come from everywhere to attend the simplest Mass in the smallest chapel - because it is God that we see and receive, his blessing, his promise in the expectation of his coming in glory. As we approach the feast of the Resurrection, in which we give thanks in a joyful and festal way for the very presence of Christ on earth, later confirmed in the sacrifice of the Eucharist. I would like to write a little article about the Eucharistic miracle occurred in Florence some centuries ago. Whether you’re high church or low church, I think this is a moving story that recalls the sacredness and holiness of this godly gift of love, even if you do not believe in miracles, it is important and essential to remember what they represent: God and his love made manifest in humankind. On 30 December 1230, an elderly priest called Uguccione, in the Florentine church of Sant’Ambrogio, after having celebrated the Mass, forgot to remove all wine from the communion chalice - the following day he found blood on it and everything soon became clear. The holy blood was soon collected inside of a little crystal ampoule and became subject of popular devotion. 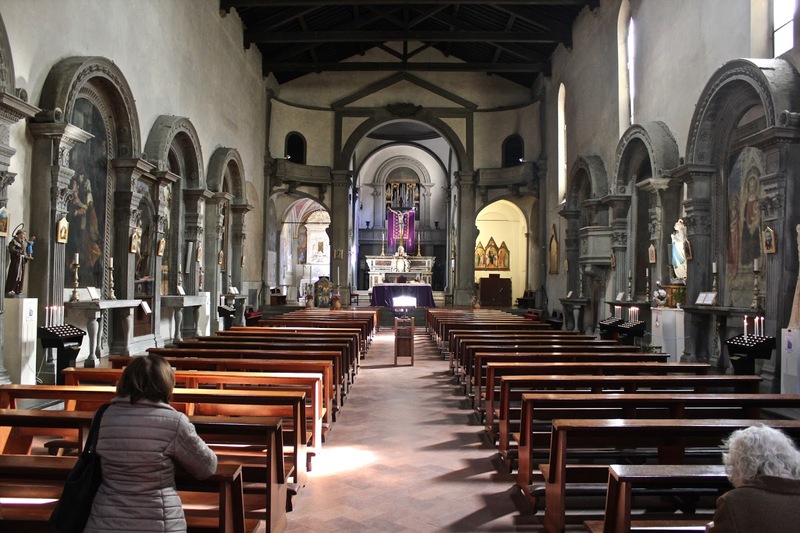 Initially, the Church was of course sceptic, as it often happens, the Bishop, Ardingo Foraboschi, kept the ampoule for a year for exams and only after that year, thanks to the help of the Franciscan friars, it was returned to the church. The Pope himself, did not really give the miracle much credit, very differently to what happened later to a similar miracle in Bolsena, even if these miracles actually proved that the beliefs of contemporary heretical groups, such as the Cathars and the Patarines, that did not believe in the real presence, and who were presence at all levels of society in the Ghibellines faction, that faction that during the wars of the Italian city states of the 12th and 13th centuries supported the Holy Emperor over the Pope. In 1279 Beatrice di Capraia dei Conti guidi, a Guelph (pro-Pope), commissioned the decoration for the ampoule and gave an endowment for the hospitality of future pilgrims. From 1317 to 1344, also the Arte dei Giudici e Notaia, (a corporation of judges and notaries), one of the most powerful in Florence, paid for the entire celebrations of the anniversary of the miracle. 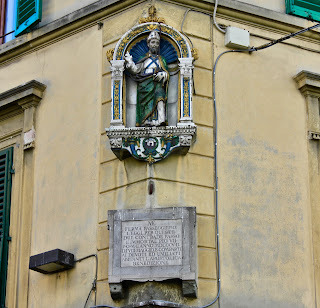 In 1340, the blood was carried around the city in order to request godly assistance against the black death, five years later, a wool merchant, Turino Baldesi, a relative of Beatrice (see above), commissioned the construction of a chapel for the relic dedicated to “his soul and his brother Giannotto”. 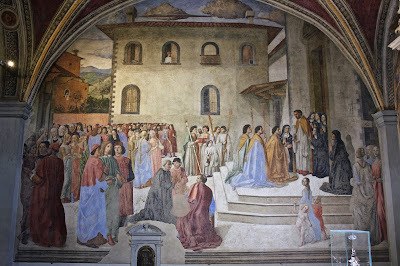 Meanwhile, the care of the Corpus Christi services was given to the Dominican friars of Santa Maria Novella, documents compiled by Thomas Aquinas show how the miracle lost importance. 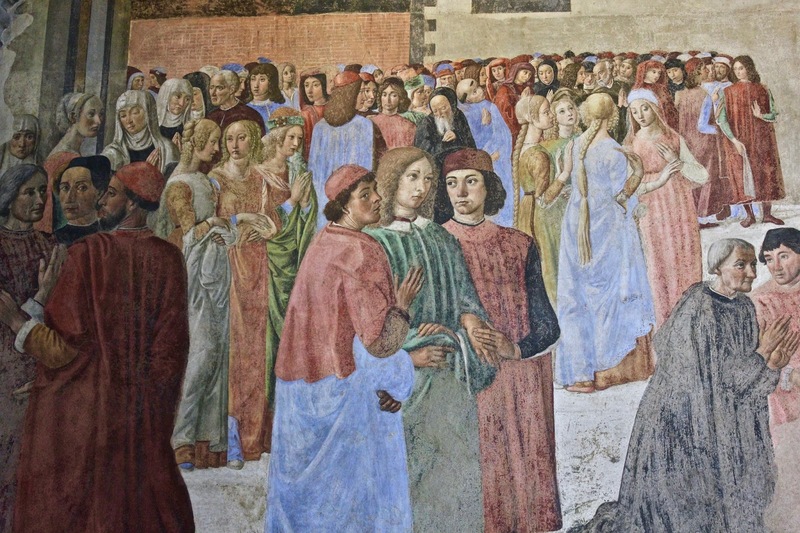 In 1405, the Ufficiali di Mercanzia, the heads of all corporations, took part of the feast of Sant’Ambrogio before war with Pisa, in 1425, the Signoria, before war Milan, opted for the procession at Santa Maria Novella. 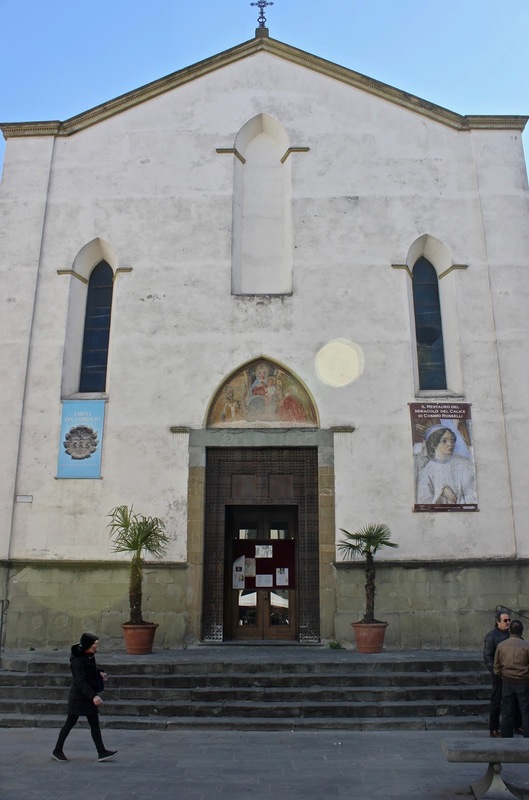 The Benedictine nuns of Sant’Ambrogio eventually established the Immaculate Conception as the main celebration of the church, a feast dear to both Saints Benedict and Ambrose. In 1431, the prior, Francesco Maringhi, commissioned a beautiful (and famous) Coronation of the Virgin, now at the Uffizi, this altarpiece would substitute the ampoule at the high altar and it would be moved to a side chapel. 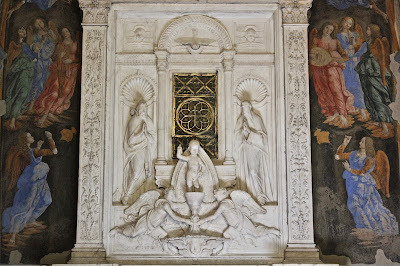 In 1468 Domenico Maringhi, related to Francesco, commissioned a new chapel with a tabernacle where to keep the precious ampoule, the tabernacle was inside of a panel by Alesso Baldovinetti with Angels and Saints Ambrose, Lawrence, John and Catherine of Alessandria. 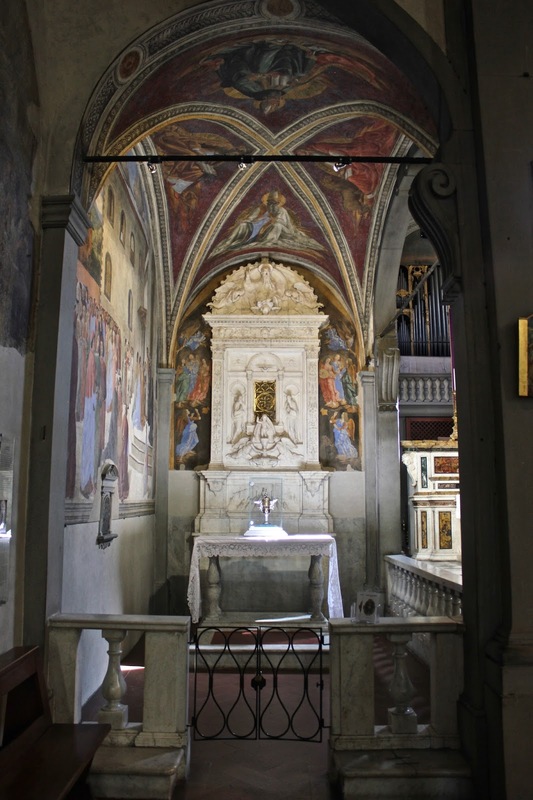 In 1481, the chapel was moved to the left of the high altar, in a chapel already belonging to the Zati family, a new beautiful marble tabernacle was commissioned to Mino da Fiesole, the outstanding Florentine sculptor, by the abbess. 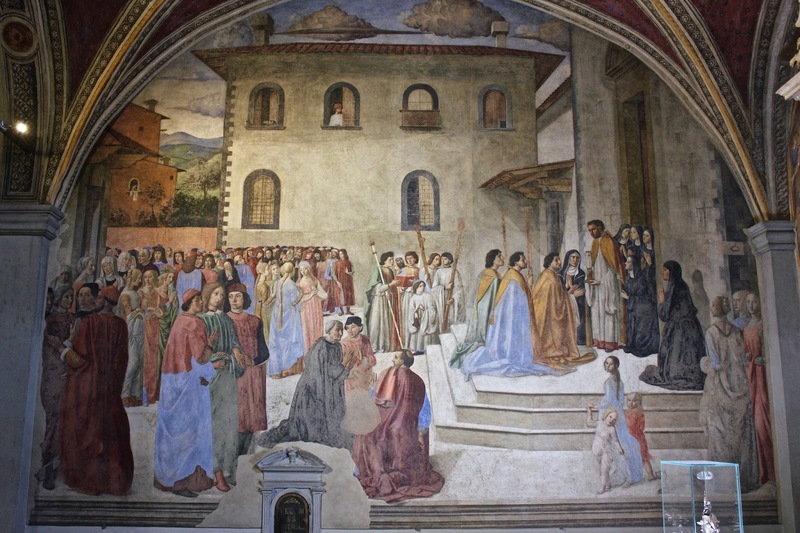 Between 1484 and 1486, Cosimo Rosselli, one of the great artists of the Renaissance, was commissioned, for a hundred florins, the decoration in fresco of the one wall on the left side of the chapel, the east wall, around the tabernacle, and the vault. 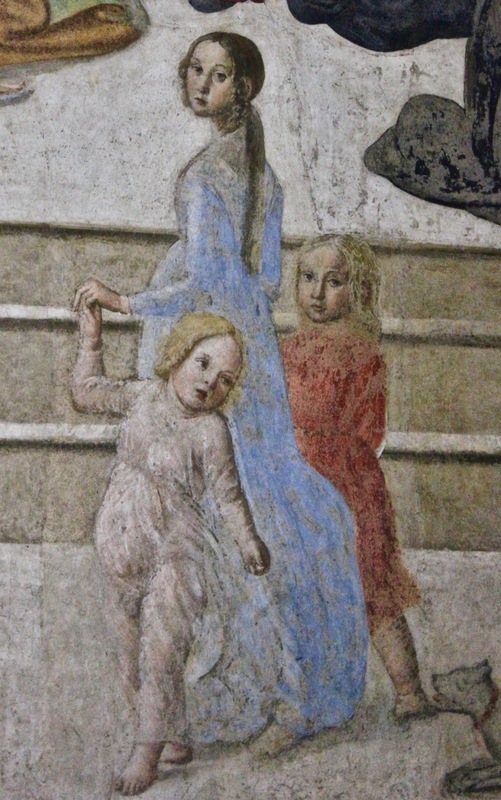 Today the frescoes are not in an excellent shape, after the fire of 1595 and the flooding of 1966, but nonetheless are entirely viewable and in good condition. 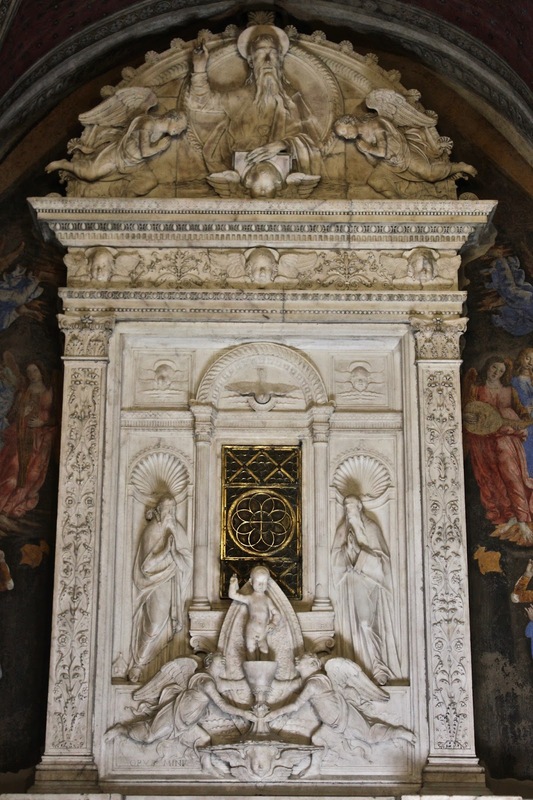 With the definite arrangement of the chapel, the Baldovinetti altarpiece was placed on another altar. The chapel is located to the left of the main presbytery, slightly elevated by a few steps, the shape is rectangular and it is open on two sides and enclosed within a Baroque marble rail. 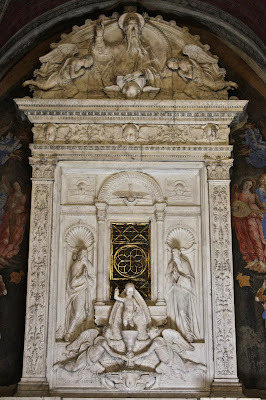 Mino da Fiesole’s tabernacle is located above the altar, as an altarpiece, it was in the late 1400s that tabernacles started to occupy that position, a similar arrangement is that of the San Chiara Chapel at the Victoria & Albert Museum in London. The nuns were surprised by the size of a previous monumental work by Mino da Fiesole in the Monastero delle Murate and commissioned the work to the sculptor in 1482, despite better hopes, the work took three years (and 160 florins) to be completed. The central panel is enclosed within two small pillars with a vegetal-themed bas-relief decoration and Composite style capitals, on top is a frieze with cherubim and a little lunette with God the Father giving a blessing between two angels and a cherub. The ciborium is framed within an imaginary niche, on its size are two other nice with Saint Ambrose and Benedict, the patron of the church and the founder of the nun’s order, both portrayed in the act of praying, above is the Holy Spirit’s dove, between two small panels with cherubim. Lower than this, two angels are holding the miraculous chalice, positioned on a cherub, the Child Jesus in the act of blessing is in a mandorla coming out of it, inspired by the ciborium of San Lorenzo by Desiderio da Settignano. His pose is similar to that of God the Father, and both with the dove, create a perfect iconography of the Holy Trinity, manifested in this miracle and sacrifice of the Eucharist, the holy food of our souls. In the base is a bas-relief in which the priest Uguccione gives te relic to the abbess of Sant’Ambrogio, the scene is set in a symmetrical way, as it was customary at the time, there are two groups of figures in the act of praying, mostly nuns and notaries. 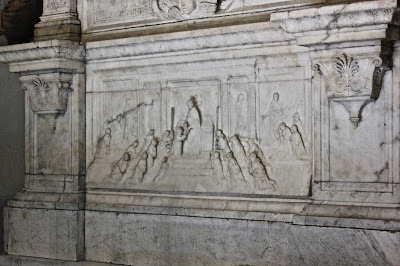 In the two niches on the two sides of the altar, in “very” bas-relief, there are personifications of Faith with a chalice and paten and a cross, in the other Hope in the act of praying. At their side, two women open doors to a series of kneeling figures. The work is signed as Opus Mini, Mino’s Work. Previously, some details of the tabernacle were gilded, today some traces remain. 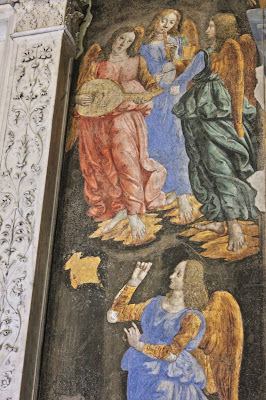 Around the tabernacle, Cosimo Rosselli, the outstanding Florentine master, painted in fresco music making angels, to spiritually praise and glorify that miracle of the Eucharist, they respected the Corpus Domini’s directions by Thomas Aquinas. In a rather customary way, the vault is decorated with doctors of the church on a red background (that once was blue): Saint Ambrose, Saint Augustine, Saint Jerome with the lion and Saint Gregory the Great with the Holy Spirit whispering in his ear. The large lunette on the left wall portrays the Miracle of the Chalice, probably a representation of its exposition of 1340 against the black death. 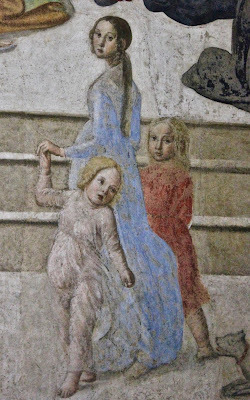 This, according to Renaissance art chronicler Giorgio Vasari, is his best fresco scene in Florence, apparently a young Fra Bartolomeo assisted the master in this work. The scene is realistic, it is set in the what the Piazza in which the church is located looked like back in the Renaissance, the side view is remindful of Masaccio’s work too, as well as being incredibly rich of portraits and buildings of the time. On the right is the church square with an original palazzo which is no longer existing, where a curious viewer assist to the scene below. The main scene is set on the right, where a group of priests and nuns is gathered around the ampoule, exposed by a bishop in a cope, at the foot of the steps are a group of acolytes, also in copes, holding candles for the Lord present in the sacrament and miracle. This is a rather “naturalistic” portrayal of the scene, for example in the shadows, the bricked up window in which the real window is shown by the pietra serena frame, the woman in the far palazzo on the left, hanging her laundry on the window, and in between these two palazzos in true Renaissance fashion, the scene spaces onto a view on the Florentine countryside, with gentle, green hills, and tall, thin trees. There is also clearly a lot of care in the clothing, hair-styles and hats, especially in women. The young lady holding two little boys, on the right, is inviting us to join the scene and participate, as if that miracle is happening now and in fact its presence is real and right on the other side of the wall! The procession, where women and men walk separately, has several contemporary portraits, as Vasari also states. On the extreme left is Rosselli’s own portrait, looking towards the viewer. In the same fashion of Ghirlandaio, Florentine fashion in fact, there is a group of three young men: Marsilio Ficino, Giovanni Pico della Mirandola and Agnolo Poliziano. In the centre is Pico, dressed in green, with his typical hair-style, he is holding arms with his colleagues. 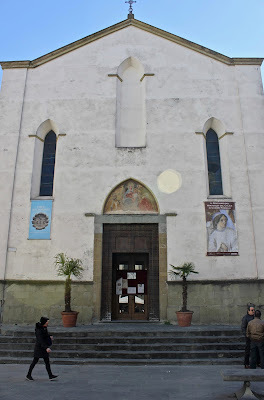 The three elderly men kneeling in the church square are probably members of the Medici family. 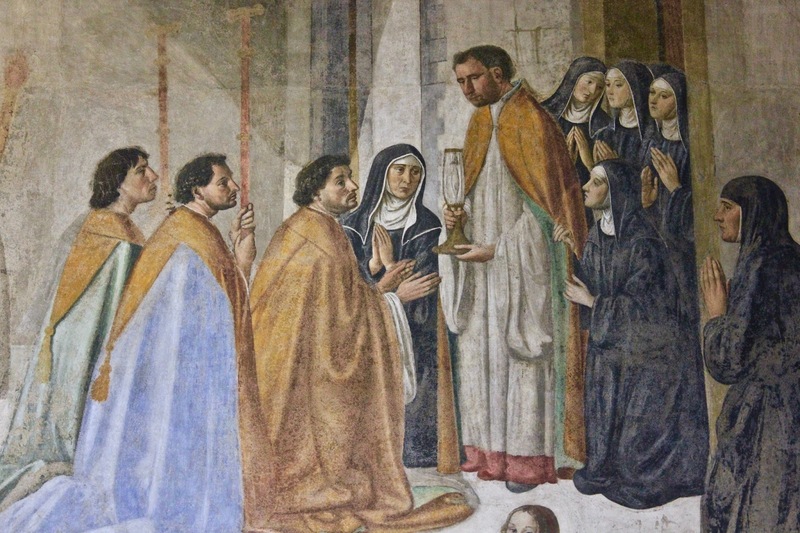 The bishop, might be Antonino Pierozzi, is donating the sacrament to Francesco di Stefano della Torre, behind him is the abbess maria de’Barbadori in the act of praying. Essentially, this great scene in which there is a clear glorification of the miracle of the eucharist invites us to join them in celebration, to give us a sense of awe and belonging to the celebration, that celebration still located in the blood and body of Our Saviour, in the nearby tabernacle. 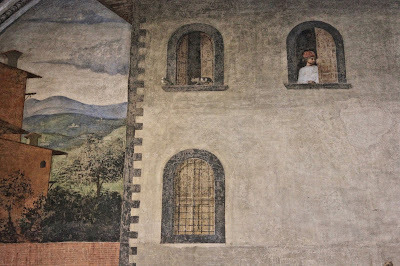 Next to the frescoes is also the sinopia of the fresco, in which we can see how the artist imagined and reimagined the work, before and during its execution. 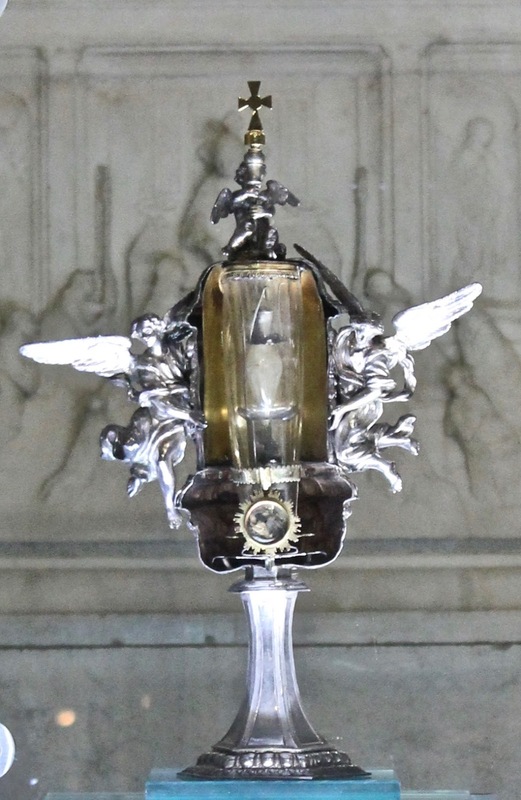 The first reliquary of this miracle was commissioned right after the miracle by the nuns, this is proven by a breviary compiled by the nuns under bishop Ardengo Trotti who dreamt about it. It was a little ivory urn, decorated with porpora and gold inlays. Unfortunately, this one was lost, and the only testimony of it and what it looked like is the Rosselli’s fresco, the recent one dates to 1511 and is by a certain Bartolomeo di Piero Sasso. This might also be a revisitation of the original reliquary. Today the blood is contained in a small ampoule protected by a crystal cylinder. The “new” reliquary is partially gilded and it is remindful of an hexagon-shaped ostensory. 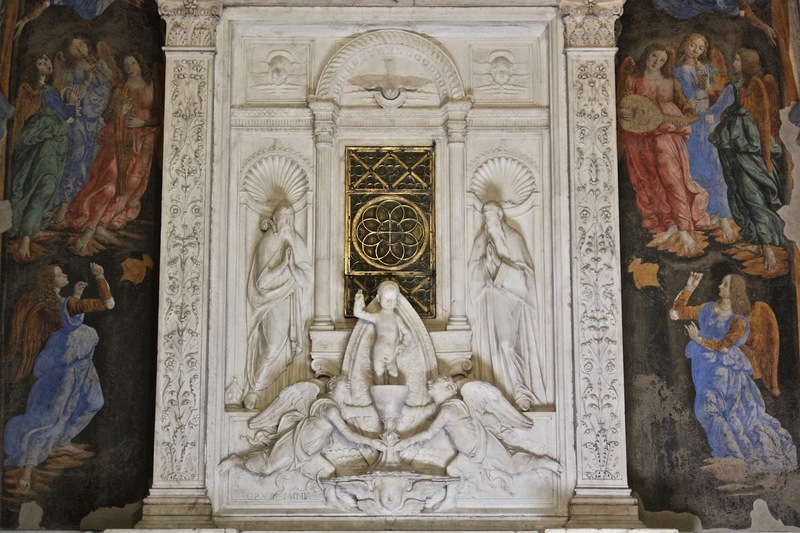 In the little niche in it are two angels flying and a third is symbolically holding the ostensory, the figures are rather fluid and plastic, in proper Renaissance style. Once the chapel was also adorned with two Della Robbia angels. This chapel is a triumph of eucharistic devotion, that devotion inspired by the greatest miracle bestowed by God the Christ on us, his very presence, in the awaiting of his coming in glory of his salvation.